Plano has quickly been growing over the last few years because it is a great place to live. 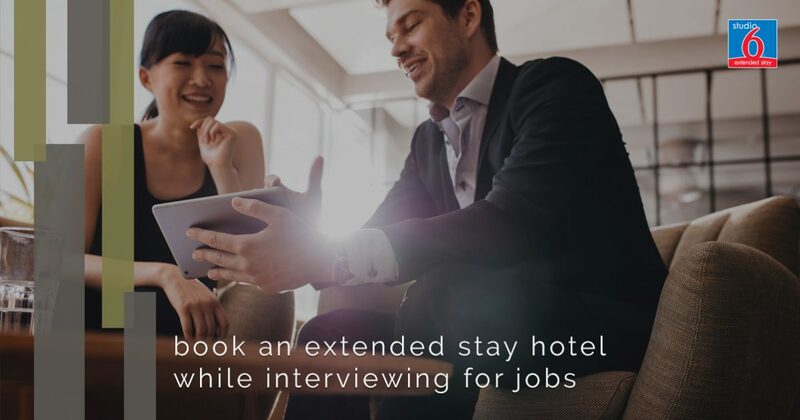 If you’ve been thinking about moving here but can’t make the jump until you have a great new job nailed down, staying at the Studio 6 extended-stay hotel until you find a job is a great idea. In this blog we will go over all of the good reasons to book with us while you’re job hunting and interviewing. One of the worst parts of looking for a job in a new city is being away from home. While staying in a hotel can be fun, the cost of room service and eating out at restaurants for every meal quickly adds up. One of the greatest benefits of staying at Studio 6 is the freedom you have to make your own meals in your kitchen and to enjoy the comfort that comes with being able to prepare your own food. Even if you’re the type of person who loves peanut butter and jelly sandwiches, being able to make them yourself can go a long way towards making you feel comfortable. The savings you’ll enjoy by making your own food will help you put more of your money towards your move to Plano. We’re also very close to a large number of restaurants in case you do feel like going out and enjoying some of the excellent food after a great interview or job offer! At Studio 6, we also offer extended cable in every room, which means that you can keep up with all of your favorite shows and news programs while you’re on the hunt for a new job. Perhaps best of all, you can bring your pets with you. We know how important it is to have your furry best friends with you because nothing makes a new place feel like home in the way that your pets do! Some of the largest employers in the area are the universities. If you’re interviewing for jobs there, Studio 6 is a great place to stay! There are three universities within three miles of our hotel, so you can get to know the area between interviews. We’re also located close to the Plano Medical Center, if you’re looking for work in the healthcare industry. Thanks to Plano’s growth, there are many industries that are seeking applicants, so you’re sure to find something that fits your skill set. Contact us at Studio 6 today to book a room in our extended-stay hotel. We look forward to offering you a great room with all of the comforts of home in an exciting area with plenty of employment opportunity. Our rates are very affordable and we are located close to many of the city’s largest employers. You and your pets will love staying with us! Whatever the reason you’re coming to Plano, Studio 6 will make your stay more comfortable. If you have any questions, check out the rest of our website or give us a call!